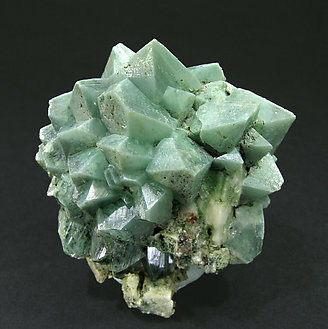 If Powellite is an uncommon species, in this specimen we need to add the Celadonite inclusions that confer a green color to the crystals but preserving the Powellite brilliance. Very uncommon. We call your attention on the perfect definition and development of very aerial and esthetic crystals. Dipyramidal crystal of Powellite. 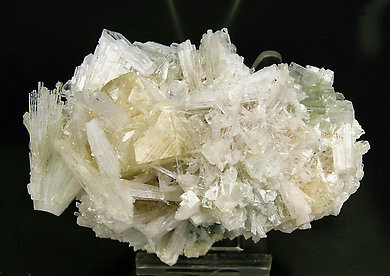 It has a considerable size and it is very bright and partially coated by bundles of acicular crystals of Scolecite and with Fluorapophyllite-(K) crystals, on matrix. Very sharp Powellite crystals in parallel growth, translucent with a cream color. 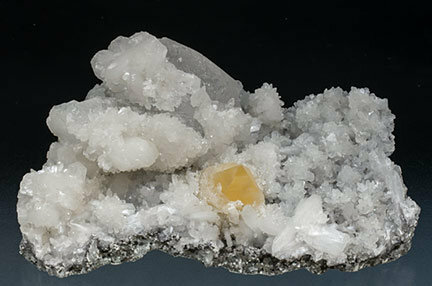 They are on a basalt matrix with Stilbite-Ca crystals, partially doubly terminated white Fluorapophyllite-(K) crystals and transparent rhombohedral Calcite crystals, one of them clearly dominant.